Women are roaring louder than ever in 2017, and Music Choice is celebrating them by declaring March Women's Music Month. 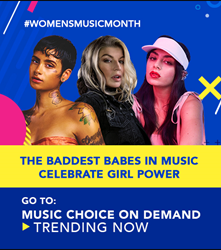 From March 6-27th, Music Choice is highlighting some of the baddest boss babes in music. Check out music videos, exclusive interviews and playlists from favorite female artists as they salute their fellow hit makers, in the Trending Now category On Demand. Exclusive women’s themed playlists from Fergie, Kehlani, and Charli XCX can be found On Demand along with popular music videos from Beyoncé, Lady Gaga, Rihanna, Ariana Grande and many more!